The NAV holds a number of Tender Sales each year. These sales give members an opportunity to sell numismatic items, with a small percentage of the price realised going to the Association. Each year we also hold a Donation Auction, where members, and generous dealers, donate items for sale in order to raise funds for the Association, which go in to promoting numismatics. Our next auction coincides with our AGM on February 15th. This book sale is a little different in that there are not only numismatic books (and some amazingly rare ones at that) but also a number of lots on a range of topics from Archaeology to Travel. There’s also a number of lots on wine. Most of these books have been kindly donated from our friends at Downies. A full listing can be downloaded here and an absentee bid form, with details on how to place a bid if you can’t make it to the meeting, can be downloaded here. Rare edition of the catalogue of the Murdoch Collection from 194, including hand written annotations of the sale. 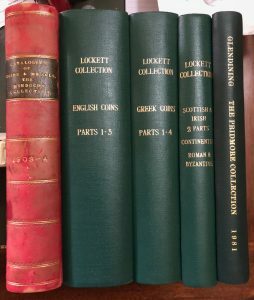 A full set of the Lockett Collection in three hardback volumes. A full set of the Pridmore Collection in a single hardback volume. 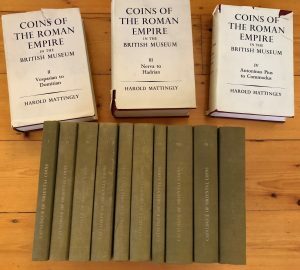 All ten volumes of the Catalogue of Oriental Coins in the British Museum from the late 19th Century. Excavation Report on the VOC Jacht Vergulde Draeck (Gilt Dragon) including a detailed look at the coins found with the wreck.